Kelsie Bongiorno works as a direct support professional at an Upstate Cerebral Palsy children’s residence in Utica. Focus on DSP’s. See why one professional does what she does so well. For the Empire State, the tax reform bill the Senate hopes to take up this week will be far worse than the version the House passed two weeks ago. Click HERE for the emailed version of the 11/27/17 CP News. The U. S. House of Representatives passed a Tax Reform Bill before they left for the Thanksgiving break and the full Senate will vote very soon on their Tax Cuts and Jobs Act, which has already passed out of the Finance Committee, in an attempt to overhaul the federal tax code. New York’s Senators Charles Schumer and Kirsten Gillibrand are fighting against Senate tax proposals that would harm people with disabilities, families, Medicaid, etc. All the House Democrats along with five NY House Republicans voted NO on the tax bill. Most of the House Republicans who voted NO represent districts with a high average state and local tax deduction, which would be scaled back significantly under the House plan. Taxpayers would no longer be able to deduct state and local income and sales taxes, and the property tax deduction would be limited to $10,000. CP of NYS is an ANCOR member and while neither have a position on tax reform, we have key positions on how tax reform may impact our services. Given these principles and a Senate tax reform vote expected this week, we believe it is important to speak up about the importance of Medicaid to people with I/DD before the Senate votes on this legislation. The changes proposed to the charitable tax deduction reduce the ability of nonprofit disability service providers to fund important services for people with intellectual and developmental disabilities (I/DD). As the only other federal support for Medicaid long term services and supports, the House passed legislation removing the medical expense deduction which could put significant strain on the Medicaid program that serves people with I/DD. The changes to the unrelated business income tax (UBIT) impact the ability of nonprofit providers and their associations to maintain limited but important revenues. The changes to state and local taxes would have a negative impact on certain states that obtain significant funding from these taxes for services for people with I/DD. The House legislation’s elimination of tax breaks on bond financing could significantly undermine the financing for affordable housing for people with I/DD. The addition of $1.5 trillion to the national debt may be used to justify future cuts in Medicaid, Medicare, or Social Security which are the main federal programs that support people with intellectual and developmental disabilities. Click HERE and contact your NY House member and let them know what their vote (NO or YES) means to people with disabilities, families, staff and volunteers in New York State. Faced with a worsening staffing crisis and increased competition from both commercial businesses and the state government, #bFair2DirectCare is urging Governor Cuomo and state lawmakers to speed up implementation of funding that would provide a living wage to nonprofit workers who care for New Yorkers with disabilities. #bFair2DirectCare is a powerful voice for 130,000 New Yorkers with developmental disabilities, their families and the not-for-profit organizations that support them. The campaign is also a call to action to remind state leaders that the nearly 100,000 DSPs who work for not-for-profit agencies do this work on behalf of the state. 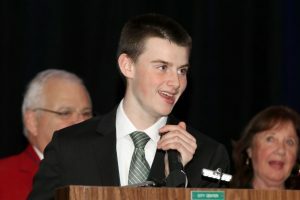 Keep up with what is going on with the campaign and plans for events across the state to support the effort by visiting the new website at http://www.bfair2directcare.com/#home. Comptroller Tom DiNapoli estimated recently that New York State faces a potential budget deficit in the next 17 months of more than $8 billion. That’s more than double Governor Andrew Cuomo’s current estimate. DiNapoli estimates that tax collections will lag $1.85 billion behind the latest projections by the Cuomo Administration’s Division of the Budget. DiNapoli’s office says the shortfall is prompted by depressed income tax collections. The Cuomo Administration’s latest deficit estimate for next year’s budget is $4.08 billion. Cuomo’s Administration proposes to cover $3.24 billion of the deficit with unspecified cuts by restraining the growth of operating spending to 2% or less. As has been the case the past several years, the Governor will likely require OPWDD and most every agency budget except for school aid and DOH Medicaid to submit budgets with 0% increases over the previous year. I M A G I N E, the 57th CP of NYS Annual Conference attracted nearly 700 people from across the state for educational workshops and meetings at the Saratoga Hilton Hotel in Saratoga Springs, October 30-November 1. 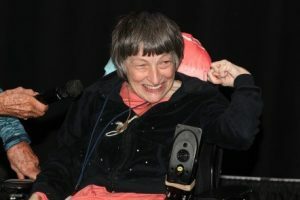 The schedule included sessions conducted by an all-star collection of nationally known presenters discussing the latest information important to people with disabilities, their families and people who support them. An October 30 Keynote Address by Mick Ebeling, a film and television producer, philanthropist, and recipient of the Muhammad Ali Humanitarian of the Year Award. Mr. Ebeling’s high-energy and inspirational talk challenged listeners to work at overcoming the concept of “impossible” so that innovation can take place. Mr. Ebeling is the CEO of Not Impossible Labs, an organization that develops creative solutions to address real-world problems and was founded on his belief that nothing is impossible. He offered stories about the success of several projects undertaken by his organization to support that belief. He says his philosophy is simple: recognize a problem, commit to solving it, and then figure out how. New York City Ballet Children’s Dance Workshop brought two world-class dancers from the New York City Ballet (NYCB) to Saratoga to conduct a dance workshop for children with disabilities. A demonstration of what the children learned in the workshop was presented for conference attendees during an Awards Reception at the Saratoga City Center later that day. View a television news story about the session HERE. A Tuesday morning Keynote Address by John J. Ratey, MD, an Associate Clinical Professor of Psychiatry at Harvard Medical School and an internationally recognized expert in Neuropsychiatry, discussed the importance of exercise in optimizing and maintaining brain function for all ages, with a focus on the critical importance of exercise for the wellbeing of people with disabilities and mental health issues. 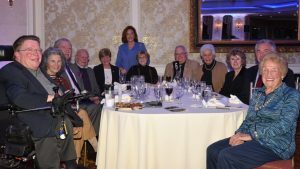 The Monday evening Annual Awards Reception highlighted the accomplishments and contributions of individuals and organizations that have improved the lives of people with disabilities and their families. Read about the Award recipients HERE. Charles Dieteman was named winner of the Anthony Koenig Volunteer Service Award. 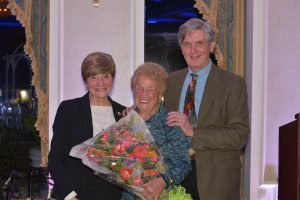 Jane Gefell, from CP Rochester, was the recipient of the Al Felmet Achievement Award. Tuesday concluded with the annual Staff Recognition Dinner where we inducted the first group into CP of NYS’s I M A G I N E “NATION” as we honored 67 outstanding staff members from Affiliates across the State. Click on the image below for a list of this year’s NATION honorees. As we all know, without our staff we would not be able to do all the outstanding work CP does in support of people with disabilities across New York – this group represents the very best of the best. To the 2017 IMAGINE NATION, we simply say congratulations and THANK YOU. For more on the CP of NYS Annual Conference, visit the conference web page HERE. The CP of NYS Annual Conference was sponsored in part by the Irwin Siegel Agency, Sutton Land Services, LLC, and BDO. She would probably not like being called an icon, but if the term fits anyone in our field, it fits Natalie Katz Rogers. 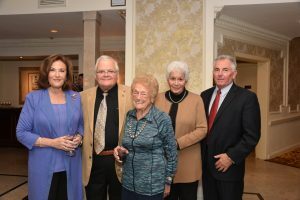 On November 14 more than 75 people from Queens and across the state gathered at a banquet facility in Queens to honor and thank her for more than 60 years of service to Queens Centers for Progress (QCP) and Cerebral Palsy Associations of New York State and all people with disabilities and their families for a lifetime of hard work, advocacy and leadership that has helped make New York a leader in the field of providing supports and services for people with disabilities and their families. Speakers, including political figures, members of the Board of Directors of QCP and CP of NYS, past and present executive directors from other agencies and friends, told stories and lauded the accomplishments of a woman who has spent most of her adult life working to create opportunities for people with developmental disabilities. Natalie organized a group of concerned parents of children with cerebral palsy in 1952 and opened a children’s center in Queens that was the beginning of QCP. The Queens organization grew quickly and joined CP of NYS. 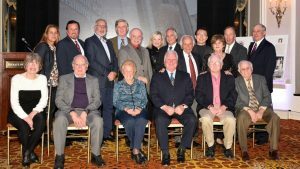 Natalie was elected to the CP of NYS Board of Directors in 1953 and remains a member of the board today. Many from Affiliates across the state know Natalie for her satirical songs performed each year at the CP of NYS Annual Conference. A highlight of her special evening happened when her chorus came together at the event to serenade Natalie with a song written by ADAPT Community Network Executive Director Ed Matthews. The New York State ELKS Association recently distributed $25,000 in grants for special projects to about a dozen non-profit agencies, including several CP of NYS Affiliates. The NYS ELKS Association donates nearly $500,000 each year to support the CP of NYS Home Service Program in all 24 Affiliates across the state. These additional grants allow Affiliates to fund other programs or special projects that might not happen without the additional generous support of the NYSEA. CP of NYS Affiliate AccessCNY was recently awarded a $2,000 grant from The Million Dollar Round Table (MDRT) Foundation to support services for veterans with mental health issues. The grant will fund AccessCNY’s House to Home program and expand housing supports to retired service men and women. AccessCNY assists veterans with mental health issues locate affordable and safe housing, providing veterans stability in their lives. At present, the program is only able to provide a roof over the veteran’s head. Funding from the MDRT Foundation will help make the house more comfortable and livable by providing essentials like beds, tables and chairs, kitchen items and other home staples. Realizing the gains that many people with autism have achieved using the iPad, the Allison Keller Education Technology Program was created in honor of Flutie Foundation Board Member Kevin Lane Keller’s daughter Allison. The goal of the program is to help fill the financial and technological gap for schools and organizations that assist individuals with autism. Since 2012, the Flutie Foundation has granted over $320,000 to 69 schools and organizations for programs specifically serving individuals with autism that have an established technology program in place or have expressed an interest in starting a program using the iPad or other technology tools. Applications will be considered for any technology tools and/or training that improves learning outcomes or performance. Maximum request is $5,000.00. Applications open in December. For more information and to apply, visit: http://www.flutiefoundation.org/allison-keller-education-technology-program. Jawonio offers lifespan services for people with intellectual disabilities, behavioral health challenges and chronic medical conditions. Congratulations on 70 years of service to the community. These are not minimum wage jobs. Direct Support Professionals, and other low-wage workers employed by not-for-profit service providers are highly trained, highly skilled and heavily scrutinized and deserve to be paid a living wage. Assemblywoman Aileen Gunther and NYS Senator Robert Ortt will be presented with the Cerebral Palsy Associations of New York State (CP of NYS) Legislator of the Year Award on October 30th at the 57th CP of NYS Annual Conference in Saratoga Springs. A bill that has already passed the House Judiciary Committee, the so-called ADA Education and Reform Act, would reward businesses that fail to comply with the law.